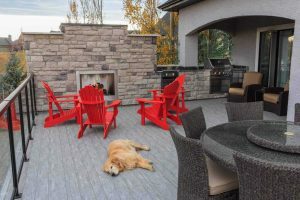 Dog sleeping on a large deck with glass railing. - Curb Design Inc.
Dog sleeping on a large deck with glass railing. Large Outdoor kitchen with BBQ. High-end furniture that includes bright red chairs.